Went ashore near Mile Rock Light-station. She met her end in the same spot that her as sister ship the Lyman Stewart, did on Oct. 7, 1922. They were both built by the Union Iron Works of San Francisco in 1914. 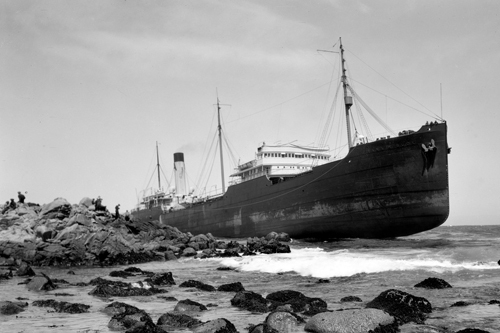 California Beach Scenes, passenger liners and Steam Schooners. Sailing Ships and Coastal schooners photo galleries. Some of the steam schooners that we have photo of are the Brooklyn, S.S. Capistrano, S.S. Carmel, Eureka, S.S. Daisy Gray, S.S. Del Norte, S. S. Eliabeth, S.S. Eureka, S.S. Firfield, S.S. Hanalei, William H. Murphy, S.S. Tamalpais, S.S. Lassen, S.S. Pomo and others.